I had a lovely time visiting with SDMW writer Alison Andreasen. Did you know she started (and later sold) a granola business? We chatted about the almost constant age-segregation that our culture mistakenly thinks is normal and about ways moms can enjoy their kids while fostering "togetherness" as a family. You can listen-in here in this post or head over to iTunes or Libsyn. If you can't find us on the app you use, let us know, and we'll look into that. Not sure how to listen to podcasts on-the-go? Check out our handy-dandy guide here. Want to help out? Please leave us reviews or comments on iTunes so that other listeners are more likely to find us. 1. Why invite our children to work and play with us when this makes everything take twice as long? 2. What are ways to involve children in daily household work? What about playtime? 3. What about the mom who likes this idea of togetherness, but is desperate for some alone time? 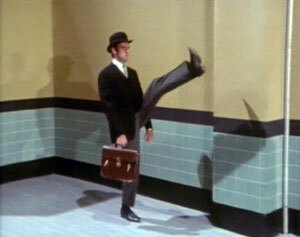 Monty Python's "Ministry of Silly Walks"